Home / Uncategorized / The Original Israeli Keffiyeh Design is Back in the Shop! 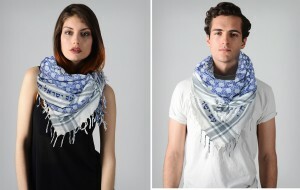 The Original Israeli Keffiyeh Design is Back in the Shop! * Back by popular demand, the Hebrew writing ‘Am Yisrael Chai’ makes its way back for our 4th design of the Keffiyeh. The new version is bigger measuring 44×47″ and 100% Cotton with blue Star of David center piece with a contrasting gray strips. A stylish way to express your Semitic pride, fusing iconic imagery with modern design highlighting the Semitic orient of this ancient people.